In May 1883, the 13-year old Mohandas was married to 14-year old Kasturbai Makhanji (her first name was usually shortened to "Kasturba," and affectionately to "Ba") in an arranged child marriage, as was the custom in the region. Recalling about the day of their marriage he once said that " As we didn't know much about marriage, for us it meant only wearing new clothes, eating sweets and playing with relatives." However, as was also the custom of the region, the adolescent bride was to spend much time at her parents' house, and away from her husband. 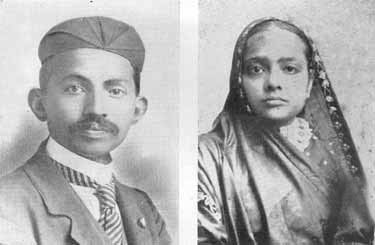 In 1885, when Gandhi was 15, the couple's first child was born, but survived only a few days; Gandhi's father, Karamchand Gandhi, had died earlier that year. Mohandas and Kasturba had four more children, all sons: Harilal, born in 1888; Manilal, born in 1892; Ramdas, born in 1897; and Devdas, born in 1900. At his middle school in Porbandar and high school in Rajkot, Gandhi remained an average student academically. He passed the matriculation exam for Samaldas College at Bhavnagar, Gujarat with some difficulty. While there, he was unhappy, in part because his family wanted him to become a barrister. At first the thirteen-year-old couple were almost too shy to speak to each other, but Gandhi soon became bossy and jealous. Kasturbai could not even play with her friends without his permission and often he would refuse it. But she was not easily cowed, and when she disobeyed him the two children would quarrel and not talk for days. Yet while Gandhi was desperately trying to assert his authority as a husband he remained a boy, so afraid of the dark that he had to sleep with a light on in his room though he was ashamed to explain this to Kasturbai.